This past spring over 50 Rainwise AgroMet weather stations were added to the NEWA network! This was a significant undertaking and included the weather stations added by our newest state member, Minnesota, via the Minnesota Apple Growers Association, and also via individual farmers in several states in the Eastern part of the US. Over the past seven years, NEWA’s growth has hit the exponential phase! The number of weather stations in the NEWA network is now over 350. 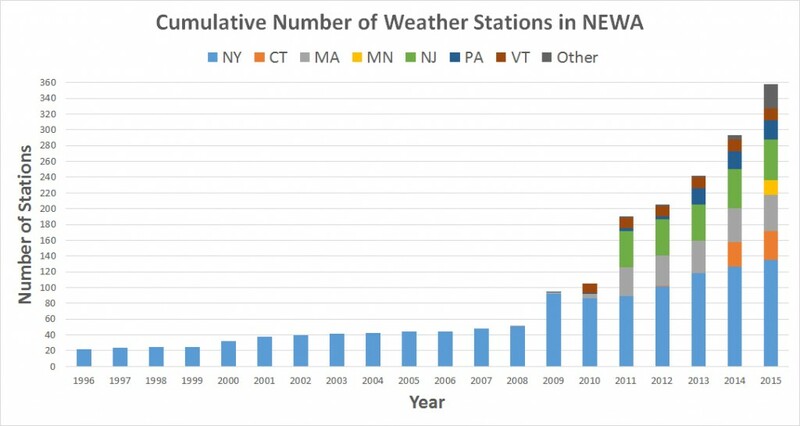 Exponential growth in weather station installations has occurred for the past seven years. A slight dip in station numbers in New York occurred following the NYS IPM Program’s funding crisis when modem lines had to be cut, but by 2012, NY numbers were back up. Starting in 2010 when Vermont joined, NEWA continues to grow its network. In 2011, Massachusetts and New Jersey joined, followed by Pennsylvania in 2013, Connecticut in 2014, and Minnesota in 2015. NEWA is now a partnership of land grant universities in Connecticut, Massachusetts, New Jersey, New York, Pennsylvania, and Vermont; along with Minnesota, courtesy of the Minnesota Apple Growers Association! A yearly fee of $1750 from each member state supports connecting to NEWA for anyone in that state. Individual farmers can connect to NEWA in non-member states with a yearly fee of only $290! We have farms in Illinois, Iowa, Maryland, Nebraska, New Hampshire, North Carolina and Wisconsin that have their weather station connected to NEWA. NEWA is now active in 14 states in the US, with a couple more included with National Weather Service airport weather stations—each with a built-in correction factor for agricultural microclimates. Let your friends and colleagues know about NEWA so they, too, can benefit from the IPM and crop production tools available. Tell them to contact me, Juliet Carroll, jec3@cornell.edu, for more information about joining NEWA to reap the benefits. Your NEWA Station Page with location-specific tools, maps, and reports. Data flow / archiving / quality control in the NEWA NRCC database. This entry was posted in information on July 10, 2015 by jec3@cornell.edu.